Back before this anime came out, I would have never believed that I would ever actually look forward to one of those cliché romantic ballroom dance scenes, or be so disappointed in the complete lack of such. That’s the sort of effect that Snow White with the Red Hair had on me. 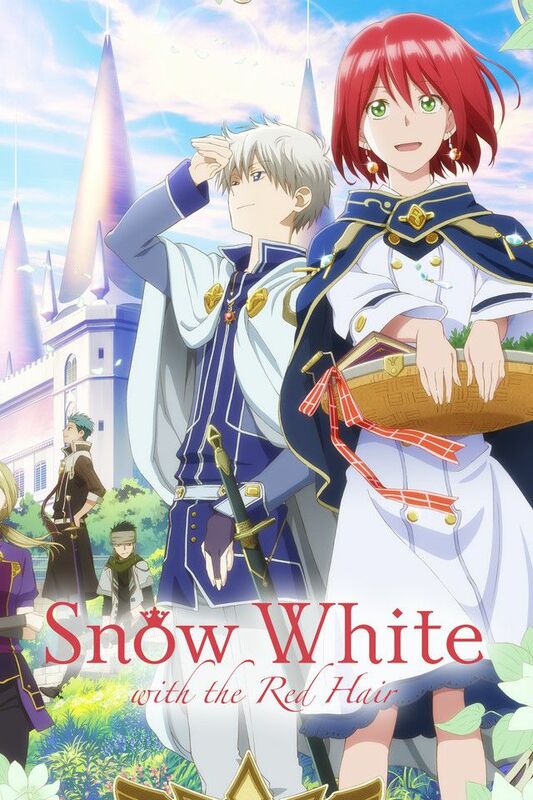 The story simply follows the developing relationship between the titular female lead, Shirayuki (meaning “Snow White”), and her charming prince, Zen Wisteria of the fair nation of Clarines. 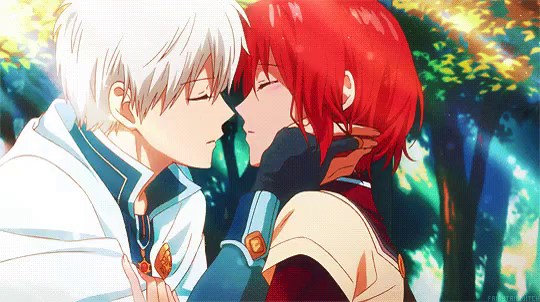 They meet partially by twist of fate, as Shirayuki is fleeing the fate of becoming a concubine to a shallow, self-absorbed prince of her own country, but they immediately click together as kindred spirits, and he gallantly defends her even as she is willing to sacrifice herself protecting him. Afterward, she moves into Clarines from her own country and strives to improve her knowledge and heal people’s hurts and illnesses as a court herbalist, and they stay in regular contact with each other. As time passes and various difficulties are met and overcome, including intrigue, danger, and prejudice based on one’s social standing, their relationship deepens into something which is definitely headed in a matrimonial direction. It is a great disappointment to me that we never quite got there! I understand there are difficulties with adapting any such story to the screen, and I appreciate that this one certainly got a bit farther along than Kawai Complex, but still! Especially after the major kidnapping storyline that dominated the second season, things felt very lackluster and drawn out. There is more to a love story than meeting, and going towards the altar! Not only is there the first meeting, and the initial pairing up, and the altar itself, but there is the other side, too, beyond said altar, and I would kind of like it if these shojo anime would actually get there once in awhile! Now, the single best part of a love story is also the single trickiest, I have found: the relationship. For it to work properly, there needs to be some method to the madness which is love. It’s not just putting two people together in the same space, you know. There needs to be some common ground they share, and some reason for their affection, and some way in which they improve, complement, and complete each other. We still tell stories about knights in shining armor, but nowadays we hate the idea of the damsel in distress. The two need to be equals in some way. And this anime manages that quite a bit better than most. While Zen gets to be the shining knight more than once, Shirayuki is not your typical damsel. She puts up a fight, with a nerve and resolve that is much more than simple ferocity. She’s intelligent, clever, compassionate, and forgiving, looking for the best in others and nurturing such as she finds it, but she’s also unyielding in the face of personal risks, advancing her own course without using other people (or her blossoming relationship with Zen) as a crutch. Honestly, hers is practically the ideal spirit of a princess. Zen, on the other hand, could be accused of being a stereotypical idealized version of a prince, both handsome and gallant. Yet there is a humanity to him, an awareness of others and an attitude of deep caring for those that many might dismiss. He surrounds himself with people who make him aspire to be a better person and a better prince in support of his family and his nation. He steps up to defend Shirayuki, and others, not only as a prince, but as a moral person, and he does not exceed the authority given to him. And while he assists her, he never infringes on her ability to fend for herself. Mind you, with this critical aspect achieved, it never felt like anything could really threaten them. By which, I mean that it would be unorthodox, and I’ve no idea how it would work out, yet their love felt so perfectly natural that I never wondered if anything could drive them apart. Shirayuki is kidnapped (a few times)? No problem. Someone is making a deal about their different social standing? No problem. They get into an argument? …ok, that actually never happened, which is certainly a shortcoming, because everybody fights sometimes so our ideal couples really should, too, but, setting that aside, I have no doubt they would work it out anyway. Because they are perfect. Perhaps a little too much so. That method to madness idea? There needs to be a little madness to the method, too! So, if there is one particular complaint I have about the show, it’s how it’s all a bit too easy. And yet things advance so slowly! I still appreciate and enjoy the plot, and the characters, and the relationships, but they all suffer from that exact problem: it’s all so pleasant that it feels flat. Where we could have gotten a truly sweeping, happy, and believable story of true love, we got one that is just… smooth. That has it’s own virtues, but it’s not terribly exciting, ya know? That sort of describes every aspect of this show, actually. All the same, while I can’t put Snow White with the Red Hair in the running for my favorite anime, I can still put it somewhere in the forward ranks, at least. It’s good, just not great. This entry was posted in Anime and Cartoons, Tuesday Review and tagged Snow White with the Red Hair. Bookmark the permalink. As much as I enjoy the series… I can’t find myself disagreeing with this sentiment.